Are you an outdoors lover? Have you found yourself in a filthy pit toilet at a trailhead, or five miles into the wilderness with the sudden urge to go? Just think about your own experiences. There is likely a time where you may have given your left sock for one of these products. 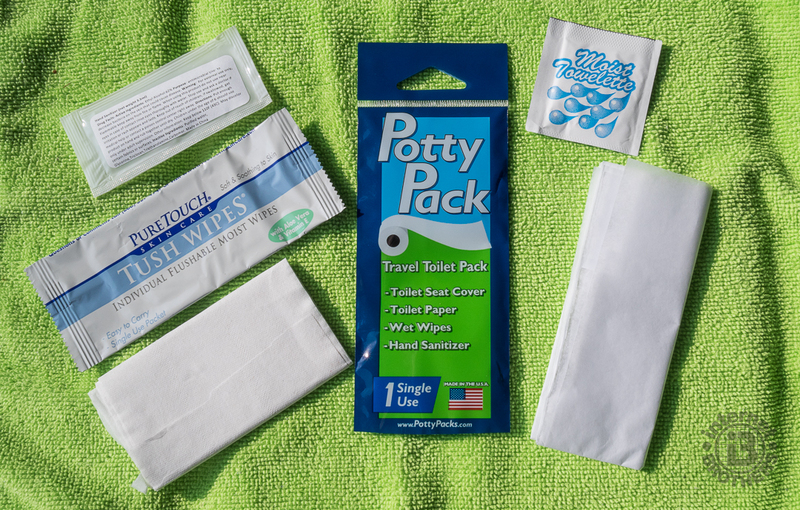 The made in the USA Potty Pack toilet pack combines everything but the toilet, all in a light weight, compact package. Included are a seat cover, 4 feet of two-ply toilet paper, wet wipes and hand sanitizer. The wet wipes are made with Vitamin E and Aloe Vera. Follow up by cleaning your hands with the sanitizer lotion and hand wipes. They also have another product that replaces the seat cover with a disposal bag for Leave No Trace fans to carry out of the backcountry. Think of the places this might come in handy: sporting events, outdoor concerts, camping, roadtrips; basically anywhere there is a porta-a-pot or pit toilet. Use this while hiking or camping, out hunting or fishing, running or cycling. It’s even great for the military. Disclosure: Potty Packs contacted me with an offer to try their outdoors toilet packs. They were provided at no cost to me. My only responsibility was an agreement to complete this review after trying the items. I was not pressured in any way to make a positive endorsement. Potty Pack container and contents. I have always carried a small roll of toilet paper in my pack, y’know, just in case. The Potty Pack is great for its light weight and compact size. Just seven inches long and a quarter inch thick, you can throw 3-4 of them in your pack and keep them there at all times. They hardly take any space, and the weight is next-to-nothing. Always a good idea when trying to lighten your load. This is a very practical, useful idea. With the toilet paper, sanitizer and moist wipes all included, you can go in the woods and also remain clean and hygienic. Put all the waste, including your own, in the disposal bag so you can pack it out of the backcountry, and you are also a good steward of the wilderness. I like their tag line: When going #2 is your #1 concern. Who hasn’t been there, right? It isn’t often that I have to go in the woods, but Nature does happen. With that in mind, the Potty Pack is convenience personified. The potty packs are priced at US$2.50 apiece, or a box of 20 for US$50.00. You can purchase them directly from Potty Packs, or at Amazon.